"A fun dip for your favorite leprechauns or just friends! Serve with raw vegetables and/or crackers of your choice. You may use low fat or fat free mayonnaise and sour cream. (You can also use red bell pepper for Christmas or Valentine's Day) Enjoy!!" In a medium-size mixing bowl, combine mayonnaise, sour cream, dill weed, seasoning salt, onion salt, Worcestershire sauce, onion flakes, parsley flakes, monosodium glutamate, and hot pepper sauce. Cover and chill for at least 2 hours. To serve slice off top of green pepper and gently clean out insides, spoon dip into pepper and sprinkle with dill weed. 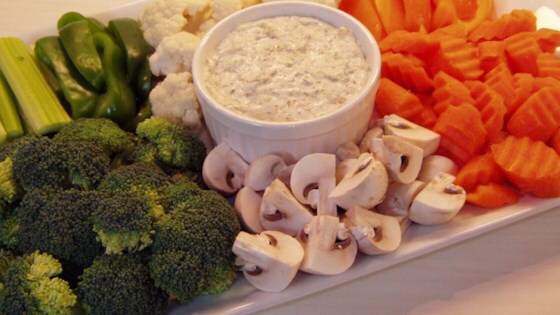 A colorful, creamy dip that’s perfect for celebrating St. Patrick's Day. I didn't use the MSG or the hot pepper sauce. It was a hit. This was quick and easy and tasted pretty good. I really like the green pepper idea.